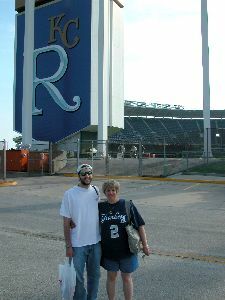 On September 13th, 2004 the three of us were in Kansas City to attend a Kansas City Royals/New York Yankees baseball game. We made sure we got to the stadium two hours before game time in order to get down close to the field to watch the Yankee players do their warm-ups, batting practice and shagging balls. Of course, the hope was that we would get some player autographs. It was an absolute thrill to see are favorite players so close up and in person. The weather was perfect, the crowd enthusiastic and the Royals fans both friendly and fun. It was a great night even though the Yankees lost the game.